Pauper Girl Parables: Death All of a Sudden -- or Not? I have been fortunate to have advance notice of my parents' deaths. With my dad, he had cancer a few times; although his heart stopped on the table during surgery in 1989 for his first bladder cancer at Duke University Medical Center -- he miraculously (as in he is in Duke's base of case studies and as having "nine lives") recovered and lived six more years until he got another set of cancers in 1995. There were no surprises except when his heart stopped during the initial urostomy and Duke's chaplain and my dad's chief surgeon were "with the family" to share the news of his impending death that first fateful day. I was OK; I had dreamt the entire scene in exact detail two hours before it happened; rushed me and my mom from the hotel across the street to the hospital, and the next thing we know, it all happened in the exact details I had dreamt. My dad recovered amazingly and went on to live another six years -- and with an entirely new take on life -- until 2005 when the other cancers attacked; they proved to be too much for chemotherapy and then one radiology treatment. So, we gathered near for Christmas 1995, and he passed two weeks later in early January at his home in the care of Hospice, my mom, and my family. I recall being chastised for giving him ice cream along with his morphine mix while I was home with him from mid-December 1995 until early January 1996. Two days after I returned to work in Southern California, he passed on and back to NC I went. My thoughts: I was going to feed him anything he wanted those last few weeks. Why not? Now we are with my mom in this same scenario. 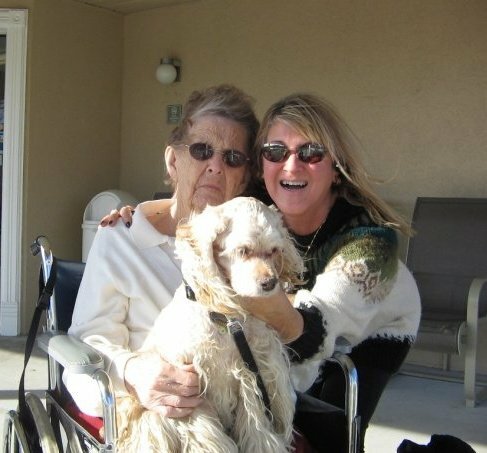 Having fought depression, breast cancer, and then Alzheimer's ever since March 2008 in a nursing home in my hometown, she is nearing the end...any moment now, although I have strongly sensed it will be in the middle of the night. It is sad but imminent -- the last two to three weeks she has had no appetite, swallows nothing, not even water. My family is on stand-by status. There is nothing left to do. Sad? Yes. Anything to be done? No. My thoughts? Let's keep it joyful! She will be with my dad now and Snooky and Klaire, my two female Cockers both of whom she adored! ;-) That matters to me! Peace be with you and much love! 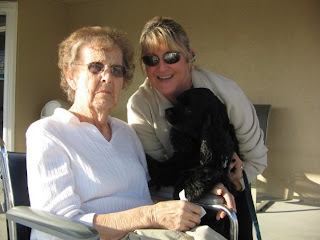 My mom, Klaire and I in 2009 -- with Koal peeking in from the bottom right! 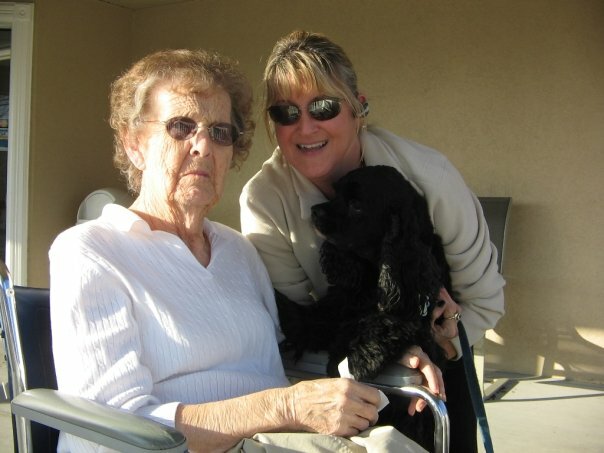 My mom, Koal and I in 2009.